For a small business working hard to an entrepreneur trying to strike out on their own, your personal and professional reviews can make or break you. A good reputation is invaluable. A lot of consumers today use online resources to find reviews of products and services before making a purchase decision. A bad review on sites like Yelp, Foursquare, and your own company’s social media pages can do a lot of harm. 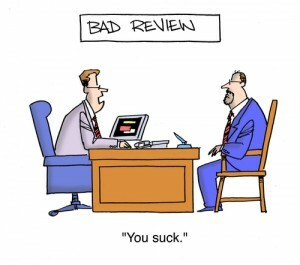 In some cases, a bad review can even be the first result that shows up when people perform an online search. You might feel that the negative posting was unwarranted, and probably feel hurt and angry. The last thing you want to do is let emotions get the better of you and start an argument. Not a path you want to follow. You risk ruining the chances of salvaging the situation by responding angrily, and nothing good comes out of calling names. Failing to acknowledge the reviewer’s claim is a wrong move on your part. Even if the issue happens to be on the customer’s end, calling them out for it on social media is unprofessional. Occasional negative reviews will probably be the work of a few unhappy people with nothing better to do, but doing nothing about bad reviews sends a message that you don’t care about your customer’s views, especially when they are unhappy with your business. Avoid paying for fake positive reviews. Some businesses will resort to this when faced with a mountain of negative feedback. Not only is it shortsighted (it doesn’t solve the underlying issues with the product/service that customers are unhappy about), but review sites like Yelp have gotten smarter at identifying paid reviews, and will alert readers or avoid publishing such reviews altogether. Identify problems before they crop up and are laid bare on the internet. Ensure that your customers are satisfied with the quality of product/service you offer, and always attempt to find out their thoughts before they leave a review. Encourage customers to communicate if they are unhappy, and have policies in place to deal with any issues promptly. Approach a negative review with tact and professionalism, and preferably on a personal level. Choose to communicate with the reviewer in private (email or inbox on social media), so you get a first-hand account of their dissatisfaction. You could go with a public approach, but only if you can keep a cool head and be professional all the time. Alternatively, you can pass on the responsibility of handling such cases to someone else/a department, but make sure that you make this clear to the person on the other end. The best way to move forward from this is to apologize and ask for the reviewer’s input. Other customers reading the review will appreciate that you took the time to admit the issue, apologize, and took steps to work towards finding a resolution. Keep a close eye on the kind of feedback left on review sites. It helps you catch potential issues before they blow out of proportion. Also, you can ask the site to take down unwarranted negative reviews, like those posted in anger or containing abusive language. Most of all, be consistent and proactive in handling bad reviews. When other customers see that you care about the feedback left about your business, it’ll be heartening to them to know that you care about their satisfaction and the quality of service they receive.